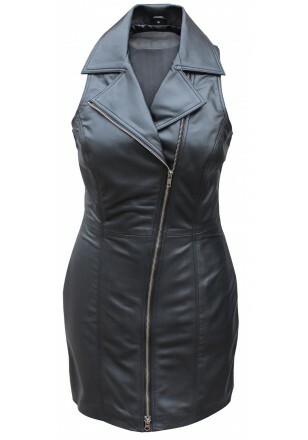 100% Genuine Soft Lambskin Leather Dress-with Front Double Slider YKK Zip. Shirt Style Collar the dress is fully lined and in nice condition. perfect for Cocktail / Evening parties, ~Night club , Motorbike wear etc......... We can customize your own size for fitting and also in any color.